Whenever the Runner passes all of the ice protecting this server, you may rez a piece of ice on Awakening Center, lowering the rez cost by 7credit, to force the Runner to encounter it. Trash that ice after the run is completed. Did you mistakenly put a big piece of Bioroid like Wotan or Janus 1.0 into your deck and now you don't have the to rez it? Perhaps Awakening Center could turn your mistake into a neat little one-off and give the runner a bit of a sweat. Laugh maniacally as you blow up your Awakening Center with a stack of unused ice on it. Let me know if you manage to build a deck that does this. Do it for science. On it's own to just rez fling Bioroids at runners I do not believe that it is that good. However when you consider that there are Director Haas' Pet Project, Archived Memories, Reclamation Order and Team Sponsorship all within faction I believe that this can do some work. I can forsee this to give you an early boost to help get you through the early game and open you up for a solid late game (who wants to face several Ichi 2.0 late game?). Unless there is a ruling otherwise, it would seem that this card can combo with TL;DR. 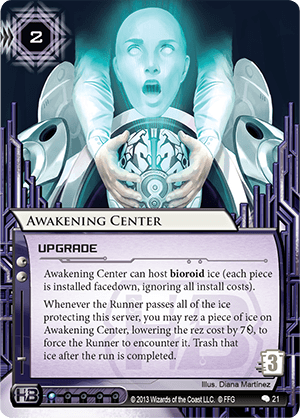 So you can drop Awakening Center in a server behind a single TL;DR, host any scary Bioroid ice, say an Ichi 2.0 or Enforcer 1.0, install an agenda (or Snare! ), and then say come get me. It's a little click intensive but for just a handful of credits you've potentially got a pretty scary server. Thanks to the 23 Seconds incident, Awakening Center got a bit more support. The Flashpoint Cycle released cards that encourage you to at least try some crazy things with Creation and Control cards like this one. You'll obviously want to put in some exciting bioroids into your Architects of Tomorrow deck. A single F3 protecting this server means that the runner might be out of when they encounter that bioroid you just forced them to encounter. After you pitch the ice, you can always call your Friends in High Places to install them regular-type OR back onto the Center. You could also get back a trashed Center. Hell, you could stack Centers. They would trigger simultaneously, so you decide the order of encounter. Vikram-Ichi double-punch! Yeah, it's still a bit janky, but it will definitely catch people off-guard.